Hi! I've been developing this type for some time now and I'd appreciate your feedback. I based the shapes of the glyphs, as closely and faithfully as appropriate it seemed, on runic systems. I only made exceptions for V and W, which I based on my A and I think it turned out interesting, and for X, which had no useful counterpart in runes. I decided to avoid curvature, though it is not exactly characteristic of runes - some of runic equivalents of latin letters have straight, broken strokes instead of bowls and arches, but not all of them and not necessarily in all varieties and scripts. That choice is something I might regret now, but at least it makes for a certain feeling. I've been wondering how some of my accented letters worked. Especially, my concern is Latvian long vowels (with ogonek). As far as I can tell, two of them found also in Polish look right in that context - and that's where I first invented them for. I used a diagonal stroke through the base of the letter instead of the traditional curvy tail - I based this approach on historical Polish ortography (about 1600). I am also curious about my /ae and /oe digraphs. Another idea I'm toying with is having the eth rune acting as lowercase /eth letter - it looks just like /thorn, but with a dot inside. Here’s what struck me right away. Inconsistent stroke widths. For instance the thick vertical stroke in the /E and the thick diagonal stroke in the /Z appear to be of two different weights. Your synthesized /X reminds me of the old Yahoo logo. It doesn’t match the other letters. Why not use a shape more like a simple cross, like gyfu? Your /Q looks too modern and out of place. How about an /O glyph with a centered vertical line, like the ku in Old Italic scripts (from which Runic scripts evolved)? When /I comes before /C, it reads like a /K (“ICELANDIC” looks like “KELANDK”). The Azeri /Ə is upside-down. Putting three alternate glyphs in the lowercase (for /H /O and /W) while duplicating the capital forms for the remainder might not work out like you hope. Settings of this font will end up containing a mix of both glyph forms, depending on the user’s capitalization rules, and it will seem random. Look into using OpenType glyph alternates if you want to include multiple forms for a glyph. Obviously this is a highly decorative face, and maximum legibility is not the goal here. Still, my instinct would be to nudge it a little further toward the legibility side. 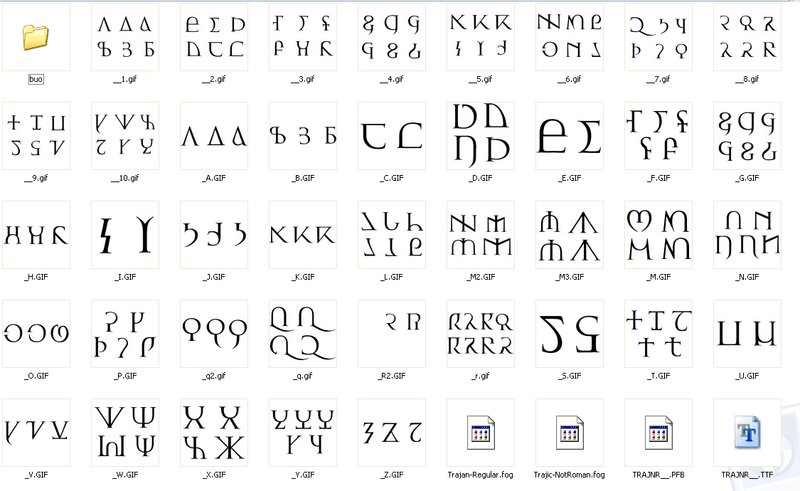 Also if you haven’t already, spend time researching the evolution of Phoenician-derived alphabets (Omniglot is a good place to start). That knowledge will help you make decisions when drawing type. Perhaps the Dalecarlian runes can give you some pointers? The were actually in active use well in to the 20th century, and also have some examples of the letter x rendered in runes. I indeed failed to ensure equal optical width in all glyphs. I modified /Z, /J, and /C - though after what you told me, its fate is uncertain. (I never liked it, too). I fixed the overlooked /schwa. I also lightened up the middle stroke in /S - I have previously made it thicker beacause... I wanted to make the glyph look smoother, make up for the unusual angle... silly. I agree that putting alternates into lowercase was a bad solution, I chose it mainly for quicker testing. I'll move the alternates, if they live, into stylistic sets, where alternative multiple dotted punctuation already is. Do you reckon I should include only one alternate in each set, say ss01 for punctuation, ss02 for alt /H, ss02 for /O, ss03 for /W? I doubt the type is suitable for long blocks of text, but if someone fancied it, then separate sets would make the customization process much quicker. Dear Frode, thanks for the suggestion. I didn't find anything more x-ey among Dalecarlian runes, though the rune A presents yet another appliance of the X shape. However, the table in the bottom of the page displays a sigel-shaped x rune, which helped me to choose sigel as a base of the new /X. So - thank you! For now I have moved the /W alternate because I found out that the rune I based it on was a modern concept. I included the second version of /X and the first version of /Q... which I now found to be nearly identical with /9. I attach updated pdf. Runic systems have clearly been a great foundation here, but I don't see a reason to fret over a literal mapping; just take the inspiration and freely make something that works for today and tomorrow. To get further ideas of shapes that evoke letters tangentially (which to me is the main appeal here, as opposed to historicism) I would offer my long-in-tooth work on Trajic notRoman as possible inspiration; another blast-from-the-past source might be Spanner Initials by PsyOps. You would of course need to re-invision things with a runic angularity. Anyway, no matter which way you go, keep it up! Throughout the design I decided to only allow 3 different angles for diagonals. Do you suggest I should drop the rule alltogether, make further exceptions and look into the rest of the glyphs? Though I think it wasn't all so bad sticking to it up until now. "To make it look equal we had to make it unequal." just take the inspiration and freely make something that works for today and tomorrow. In the process I think I forgot that's what I did initially. Take a look at /E, which is only slightly influenced by the Ehwaz rune. My only wish was to give each letter a feeling of connection—recognizable to those who know runes a little (I ran into a friend who does just 3 days ago, and he's no linguist—apparently that's just some folks' secret hobby). But perhaps I started to run into obscure details too much. Could you make that “what appears to be 3 different angles for diagonals”? To be precise, "what is 3 different angles but appears to be more". But I actually forgot that I also introduced a 4th angle for /P. Maybe that's why you thought my '3' angles looked like more than 3. As much as measures such as height and width are prone to optical illusions, I think angles are relatively easy to judge. Even when they are tweaked between glyphs, as we usually see a steeper angle in W compared to V, it is W's width that has been effectively changed. In casual/classic typefaces angles play a lesser role, as there are lots of curves and harmony between strokes is easier to maintain so we can compromise angles for the sake of other factors such as width or height (and thanks to curvature there are even less angles to compromise). I think that in an angular face like mine it is more crucial to keep steady stroke angle to maintain a harmonious ductus. Anyway, I think I'm moving further away from mathematical approach thanks to your input. Forgive me, I’m confused by what you wrote. In case you found my post a little cryptic, what I meant was that it makes sense to confine this design to three angles, but that you should allow for some leeway for optical adjustments so that they actually appear the same. In the A for example, the two thin diagonal does not appear to have the same angle: The longest need to lean a little more, IMO. Thank you for explaining. I admit it didn't quite dawn on me until now. I guess I'd make a better parent than a type designer - I accept and love my 'children' for who they are. When I got back to /A I didn't think that the thin diagonals appear to have different angles, but that the whole looks skewed. So I tucked both thin strokes towards the thick one a bit. I kept in mind what you said and I moved the long one farther. I'm uncertain if it's there yet. For now, I don't know what else might need improvements, perhaps /E or /U are a bit unstable? I added a serify thing to the /C, I think it does little to solve the Kelandk problem, but it does add a little stability to the glyph. Might be worth trying an /M/ with counters that don't completely close. That might help the "pq" effect. Hey everyone, I decided to revisit Pertho. Here's a new PDF presenting some updates and changes. Now basic variants for V and W are inspired by rune Fehu with dot (runic "v"). Thus every letter in the basic Latin is now somehow connected to one or more runes. (I recognized that V and W being just copycats of A were not enough). I kept the old versions as alternates. Additionally, E and F were tweaked (they were too narrow before) and punctuation was modified. After completing the "historically faithful" goal I admit historicism is not the main goal any more: making the design useful is. Maybe more legible, too.